A KOTOBUKIYA Japanese import! Up next in the hit series of Ani*Statues from Shining Hearts (the most recent release in the "Shining" series) is another member of the beast race and a thief who refers to herself as "Black Tail," ~MISCHIEVOUS SLINKING CAT~ XIAO MEI! 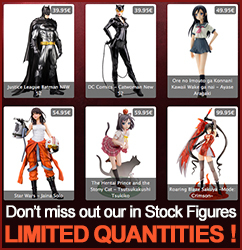 The feisty and feline beauty comes to you exclusively based on original character designs by famed artist Tony Taka. Xiao Mei kneels on the ground in a playful cat-like pose, arching her back as she bends forward while looking at you over her shoulder. Her outfit consists of a loose-fitting white slip that shows off lots of skin along with a purple waist sash tied in a pretty bow on her left side. Xiao accessorizes this look with one white thigh high stocking and matching gloves (one short and one long), petite shoes, and puffy white and purple hair coverings behind her adorable cat ears. A long feline tail emerges from the back of the girl's outfit to swirl around her, and she holds the tip of it provocatively. Xiao's pretty face is the picture of mischievousness, and included with her is a removable taiyaki (Japanese fish-shaped cake) that she can hold in her mouth! Sculpted by Kouei Matsumoto, Xaio is nearly 5 inches tall (1/6 scale) crouched on her special cushion base.